Dependable, fun to drive and luxurious. 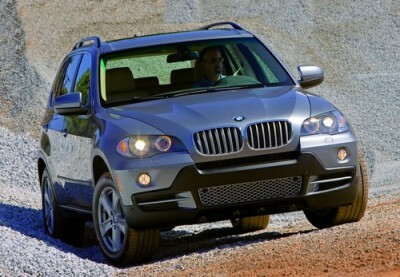 That’s what the BMW X5 xDrive 30i is. And once you drive one, you will fall absolutely in love with it. With an All Wheel Drive system that is phenomenal, and a list of safety features that BMW is renowned for, you can’t go wrong. Under the bonnet is a 6-cylinder in-line petrol engine with four valve technology meshed with a 6-speed automatic transmission with Steptronic. The entire system is smooth, quiet and powerful. Inside the BMW X5 xDrive 30i you will be pampered with a whole host of standard and optional features, some of which include, power adjustable and heated leather driver and passenger seats, with 3-position memory on the driver’s seat, automatic air conditioning with a choice of 2-zone or 4-zone that has separate temperature controls in the rear. Other features and options include, 3rd row seats, rear heated seats, heated steering wheel with multifunction audio and cruise control functions, sun blinds for rear windscreen and side windows, comfort access system, panoramic glass roof, with tilt/slide that operates conveniently by the vehicle key, split tailgate, power windows, locks and mirrors, entertainment control display that includes CD/DVD player, navigation and audio system. There is a rear entertainment system with CD/DVD, HiFi loudspeaker system and much more. Safety features on the BMW X5 xDrive 30i include Dynamic Stability Control; driver and passenger front, side and head airbags; rear head airbags; an alarm system; Hill Decent control; a rollover sensor and a superb brake-force display. For an absolutely fun vehicle that will get your heart racing, take the BMW X5 xDrive 30i for a drive today! For any more information on the BMW X5 xDrive 3.0i, or for that matter any other new car, contact one of our friendly consultants on 1300 303 181. If you’d like some fleet discount pricing (yes even for private buyers! ), we can submit vehicle quote requests out to our national network of BMW dealers and come back with pricing within 24 hours. Private Fleet – car buying made easy!